Backlit media has become one of the most popular means of advertising in recent years, driven by the falling costs of digital printing. As the technology improves so too does the effectiveness of using an illuminated sign over a non-illuminated one. Even the glossiest, non-lit, large format posters and prints will find it challenging to compete with an illuminated sign. First, you have a lightbox or kiosk, the glass-faced container for displaying the print. These light boxes are usually slim and lightweight, made from plastic, and install flush to the wall. They are designed with a spring-tensioned frame, which opens and allows prints to be changed with ease.The best ones come with a range of frame finishes, from powdered coated to aluminum. They grip the print, avoiding unprofessional wrinkles. Second, you have the means of illumination: compact LED units that sit behind the print. These LEDs are cheap to install and very energy-efficient, which means energy costs are kept low. LEDs convert a higher proportion of energy into light; far less is wasted as heat. They also have long lifespans, over twice as long as conventional lighting. Finally, you have the print itself, which bears the branded artwork. The print can be either paper-based or made from polyester or vinyl film. All these materials are translucent, allowing the white light from the LEDs to pass through, illuminating the text and images. The results can be dazzling, with bold, rich colors and a message which leaps out at the observer. Strategically placed at point-of-sale locations, backlit advertising media gets cash registers ringing. This makes them ideal for sales counters, exhibition booths, anywhere where money changes hands. As well as being mounted on walls, light boxes can be hung from the ceiling or placed as freestanding units on legs. The latter two options allow you to double the cost-effectiveness of your advertising with a double-sided lightbox. Get twice the impact for a minimal extra cost. Promote your brand using customizable fonts and graphics. Use backlit media to get any message across, whether promotional or instructional. For a really striking effect that will get heads turning, try using frosted vinyl film in your lightbox. It’s as cool as ice! Nothing gets your brand noticed better than a prominent array of iridescent backlit signs. They’re great for shopping malls, hotel lounges, rail stations, and supermarkets. Backlit advertising media is one of the most powerful marketing tools out there. For a very modest investment, the revenue returns can be enormous. Find your inspiration on Pinterest Backlit Media Boards! Mactac has announced improvements to their line of PERMACOLOR ColorGard LUV overlaminates. Already considered to be some of the best laminating films on the market, the improvements elevates this product into an even highly level of performance. ColorGard LUV films offer protection from abrasion, moisture and other potentially damaging effects in both indoor and outdoor environments. Additionally, as an added benefit these films enhance the vibrancy of the graphic. Why Use High-Performance Laminating Films? Laminating are used to protect printed graphics from light, dirt and moisture both indoors and outdoors. It should also be known that not all laminating films are created equal. Low-grade laminating films can bubble, crack, warp, and cause graphics to fade. A high-performance overlaminate, such as PERMACOLOR ColorGard LUV by Mactac offers UV protection, superior flexibility/conformability, superior adhesion, long-term protection, and graphic enhancement. There are several considerations to make when choosing print media for bus shelters. Will the graphic need to be see-through, backlit, or block-out? What about the duration and exposure to environmental elements such as sun and water? There are a variety of substrates available that are designed specifically to meet the demands of bus shelters. When taking on the task of designing and printing signage for bus shelters, it’s best to survey the location of the application to help make the proper media selection. From vinyl to paper-based and polyester, each substrate can offer unique benefits specific to the intent of the application. 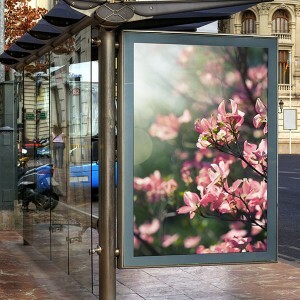 Paper-based media for bus shelters such as Blox-Lite by conVerd / FiberMark is a double-sided CS2 opaque blockout material that is 100% recyclable, FSC certified, and printable on both sides and can be used to blockout light. For PVC Vinyl media options, Mactac offers a product that is designed to excel in the transit graphics area. Mactac IMAGin DigiTrans JDT429 is a 4 mil gloss vinyl with a tough black acrylic adhesive engineered to meet the application and removability requirements of the transit market. It offers 3 year outdoor durability when combined with the recommended Permacolor LUV laminate. Paper-Based – CityLight® Select 175 by conVerd / FiberMark is an 8 mil wet strength day/night backlit paper-based backlit print media ideal for transit applications. It is part of the eco-responsible conVerd™ brand and is an economical alternative to PET backlit.